Researchers from Universidad Carlos III de Madrid, Universitat Pompeu Fabra and Universidad de Valladolid joined together at Valladolid, Spain, for the 4th EEE meeting last June 23 and 24. The purpose of this meeting was presenting the results of the project and establishing collaborations for the realization of evaluation experiences with teachers and learners. Three external researchers were invited to the event to share their knowledge and provide feedback in topics addressed by the EEE Project: Dr. Yishay Mor, independent consultant in educational technologies and design, Dr. Marcelo Milrad, Full Professor of Media Technology at the Faculty of Technology at Linnaeus University in Sweden, and Dr. François Bry, Full Professor of Computer Sciences at the Ludwig-Maximilians-Universität München in Germany. Last September 17th 2013, the researchers Adolfo Ruiz-Calleja, Guillermo Vega-Gorgojo, Juan I. Asensio-Pérez, Eduardo Gómez-Sánchez and Miguel L. Bote-Lorenzo, from the Universidad de Valladolid, and Carlos Alario-Hoyos, from the Universidad Carlos III de Madrid (UC3M), all collaborating with the Spanish National Project EEE, were awarded with the third prize in the Veni Competition organized by the Linked Up Project, as well as the People's Choice award of this same competition. These awards were granted for We-Share, a social annotation application for educational ICT tools. This application allows educators both to publish and retrieve educational descriptions of ICT tools and to share their experience using them in their classrooms. The jury underlined the innovation of We-Share in the learning domain and its capability to relate non-educational data from the Web to educational-specific one published by educators. 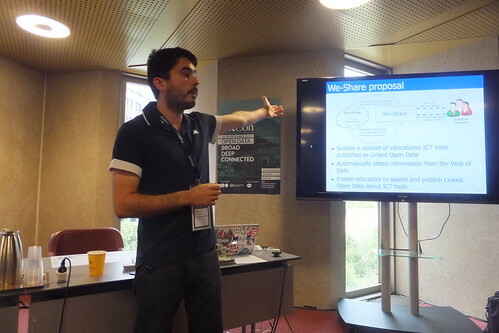 In addition, the authors were invited to present We-Share in the Open Education Panel Session held at OKCon in Geneva, as well as to present a poster in this same conference. There were over 100 attendees and the authors obtained a valuable feedback about their research. Last September 19th 2013 the researchers Carlos Alario-Hoyos, Mar Pérez-Sanagustín, Carlos Delgado-Kloos, Hugo A. Parada G., Mario Muñoz-Organero from the Universidad Carlos III de Madrid (UC3M) and Davinia Hernández-Leo, Raúl Nieves, Juan Carlos Carrascal y Josep Blat from the Universitat Pompeu Fabra (UPF), all collaborating with the Spanish National Project EEE, were awarded with the best paper award and the first and second prizes for the best application demo at the European Conference on Technology Enhanced Learning (EC-TEL). The best paper award was granted to Alario-Hoyos et al. for their contribution entitled "Analysing the impact of built-in and external Social Tools in a MOOC on Educational Technologies", which analyzes the impact of different social tools in a MOOC carried out at the UC3M. The first prize for the best application demo was for etiquetAR from the UC3M, an application to design interactive learning experiences using intelligent tags. Finally, the second prize for the best application demo was for the Signal Orchestration System from the UPF, an interactive tool to support orchestration in face-to-face group activities. The best student paper award went for the work “Usage Context-Boosted Filtering for Recommender Systems in TEL” by Katia Niemann and Martin Wolpers, researchers from the Fraunhofer FIT. In the conference web page you can find the list of all the granted researchers and the titles of their works.